In reviewing and analyzing the data from Brandon Hall Group’s 2018 Performance Development Study, we arrived at five essential strategies to make the performance development evolution successful and a contributor to business growth. This may seem obvious, but only 35 percent of organizations said their performance development process is aligned with their organization’s business objectives. It is a major problem throughout human capital management. In Brandon Hall Group’s HCM Outlook 2018 Study, the top priority for responding organizations in all five areas of HCM — learning, talent management, talent acquisition, leadership development, and workforce management/HR—was aligning the strategy of that function with business objectives. The research shows that the main driver of change in performance development is providing more feedback to employees so they can continue to develop skills and improve their performance. In the traditional system of annual appraisals with scant interim reviews, managers had little incentive to provide that feedback. Managers cannot be expected to magically become better coaches and mentors or have effective performance conversations simply because the new performance development paradigm requires it. There is no right way to train managers to improve their performance development abilities. Specifically targeted programs or existing high-potential and leadership development programs might be a good choice, or whatever works best within your organization’s culture. But we believe there should be a sense of urgency in narrowing the gap between the intention of enhancing performance development and the execution. 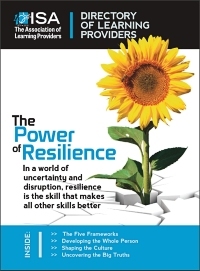 When change is introduced in organizations, as has been the case with performance development, employees are both apprehensive and hopeful. Management has a window of opportunity to match reality to intention. If the advent of more employee feedback and better performance development is to be successful, organizations must act decisively to make it happen. As performance development evolves, it is almost impossible to do it well without technology. The amount of data, analysis, and instantaneous communication required to connect employees with each other and their managers simply cannot be done manually. All talent management platforms either have a performance development module or the ability to integrate with dedicated performance development software. Therefore, it is disturbing that 17 percent of organizations overall not only lack performance development technology, but don’t plan to add it in the foreseeable future. 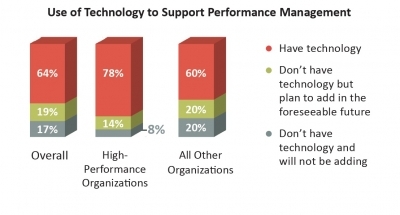 Note that high-performance organizations—those that experience year-over-year increases in key performance indicators (KPIs) such as employee engagement and retention, customer satisfaction and retention, revenue and market share, plus quality of hire—are significantly more likely to use performance development technology. Organizations that use performance development technology are much more likely to have their performance development aligned with business goals, which makes sense because alignment requires communication, transparency, and regular updating, all of which are facilitated by technology. As with most organizational issues, technology alone will not fix any problems, but it is a vital component of organizational improvement. Team-focused performance management is the next plateau in the evolution of performance development. As organizations become flatter, more dispersed, and more collaborative, cross-functional teams increasingly are used to complete projects and initiatives that transcend department or geographic boundaries. Team performance must be evaluated along with individual contributions within those teams. Furthermore, team members should be accountable as individuals for their performance within teams. This is not a new concept, but due to the complexity of hierarchies, processes, goals, and technologies needed, it has been more theory than practice. But that is beginning to change. Overall, approximately 1 in 4 organizations has a formal performance development process in place for teams. That increases among high-performance organizations and those where performance development is aligned with business goals. The data does not yet show any specific benefit to formal performance development for teams, such as increased KPIs. But our work with clients indicates that many organizations are aware they need to do a better job of understanding the quality of work in teams and that team members must be evaluated and developed. The good news, as this trend develops, is that of the relatively few organizations that formally evaluate team performance, almost two-thirds (65 percent) address team performance in individual team members’ performance appraisals. This is a strong indication that, while organizations are still growing into team performance development, they understand the importance of holding individuals accountable. Many organizations clearly perceive a need to revamp their performance development processes, otherwise we would not see such large-scale changes taking place. However, less than half of these organizations overall are gathering opinions and ideas from their employees on exactly what needs to be improved. The percentages are significantly better, however, among high-performance organizations and those in which performance development and business objectives are aligned. These organizations understand the importance of feedback as a driver of continuous improvement and have found a way to make it happen. 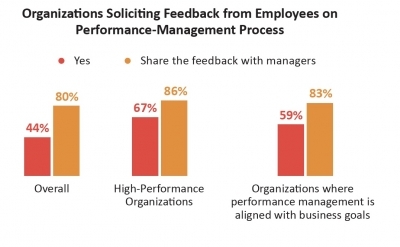 The good news is that 80 percent or more of organizations that do get employee feedback on performance development share it with their managers. Without getting feedback from employees and sharing it with managers, organizations leave themselves without a vital source of data and are relying on more indirect measures—not that those measures are worthless. As performance development evolves, organizations must collect as much data as possible to see if the changes they made are working or whether further adjustment or training is needed. To determine organizational needs for performance development, it’s helpful to assess your current state and prioritize the changes you want to make. You can download a free copy of the tool, Determining Your Organization’s Performance Development Priorities, based on leading practices gleaned from Brandon Hall Group’s research. It can be used to gather opinions from the HR/Talent Management team, managers, or other performance development stakeholders. This can lead to good discussions about future performance development strategies and tactics. Claude Werder is vice president and principal HCM analyst at Brandon Hall Group. The firm’s vision is to inspire a better workplace experience, and its mission is to empower excellence in organizations around the world through its research and tools. Brandon Hall Group has five HCM practices and produces the Brandon Hall Group HCM Excellence Awards and Excellence in Technology Awards; the Women in Leadership Summit; and the annual HCM Excellence Conference, Jan. 22-25, 2019, in West Palm Beach, FL.